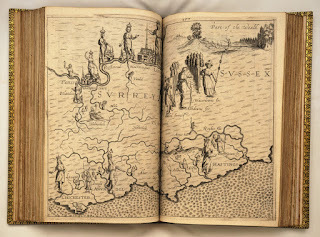 His most ambitious project, however, was Poly-Olbion, which in the mellifluous phrasing of the subtitle offers a ‘description of tracts, rivers, mountains, forests and other parts of this renowned Isle of Great Britain, with intermixture of the most remarkable stories, antiquities, wonders, rarities, pleasures and commodities of the same’. Written in rhymed couplets and stretching to more than 15,000 lines of iambic hexameter, it took many years to compose. The first part was published in 1613 and the second did not appear until 1622. Drayton intended a third instalment, dedicated to the wonders of Scotland, but he did not live to complete this plan. 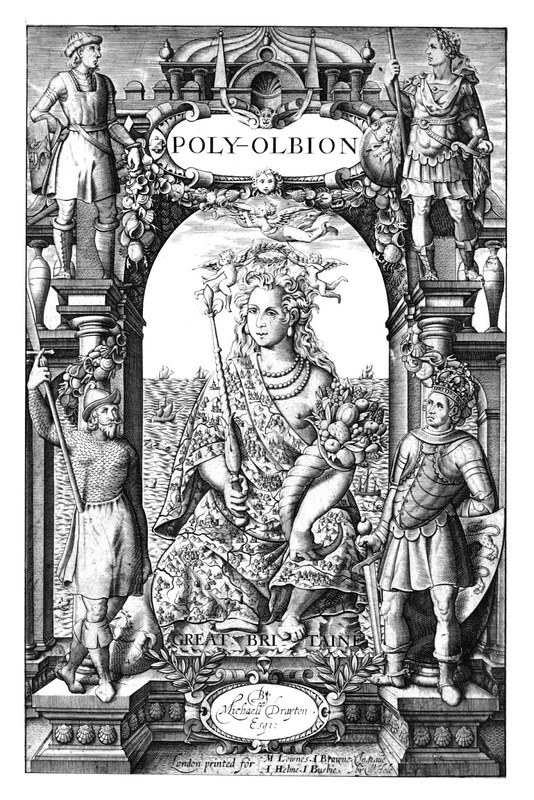 Ref: Michael Drayton, Poly-Olbion, Frontispiece, London: Mathew Lownes et al, 1613, and Augustine Mathewes et al, 1622. Personification is central to Drayton’s technique in Poly-Olbion. Not only does the Dart River narrate the story of Brutus, great-grandson of Aeneas and legendary founder of Britain, it is praised for the eloquence of its narration by a chorus of lesser rivers. Later in the poem, the Shropshire hills pledge their love for Wales. Other landmarks compete vociferously in beauty contests or else commiserate on their respective misfortunes. 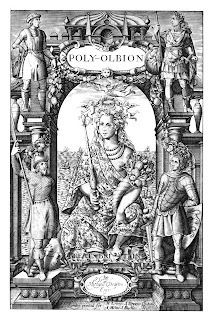 Yet, in spite of Drayton’s eccentric methodology, Poly-Olbion might be regarded as an ancestor of the detailed guides to local attractions now published by Fodor, Frommer, Michelin and Lonely Planet. Ref: Michael Drayton, Poly-Olbion, Surrey & Sussex, London: Mathew Lownes et al, 1613, and Augustine Mathewes et all, 1622. 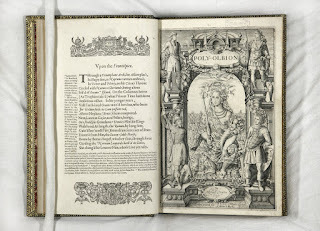 Drayton’s learned friend John Selden (1584-1654), keeper of the records of the Inner Temple, contributed annotations to the first part of Poly-Olbion. 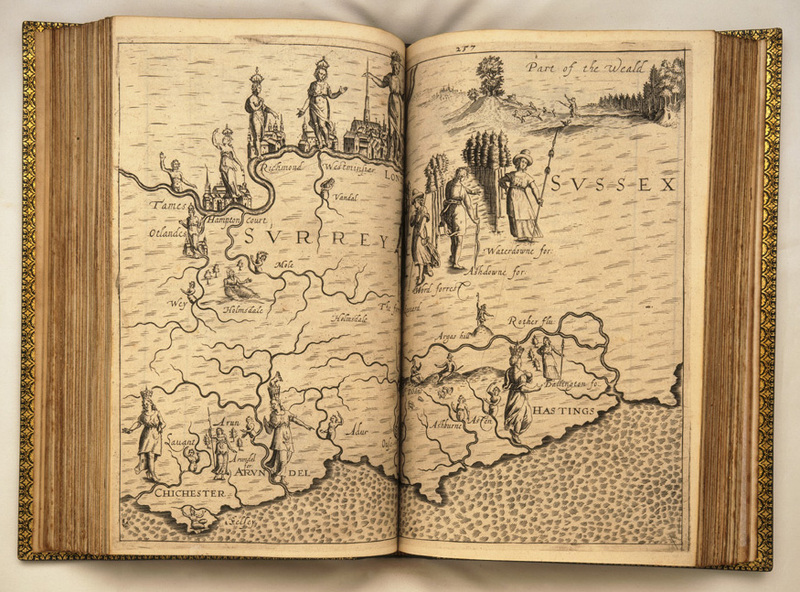 The county maps, decorated with mythological figures, that preface each canto of the poem are generally attributed to the artist William Hole, whose name appears as engraver of the illustration on the title page. Auckland Libraries' copy came from Sir George Grey. Ref: MichaelDrayton, Poly-Olbion, Frontispiece, London: Mathew Lownes et al,1613, and Augustine Mathewes et all, 1622. 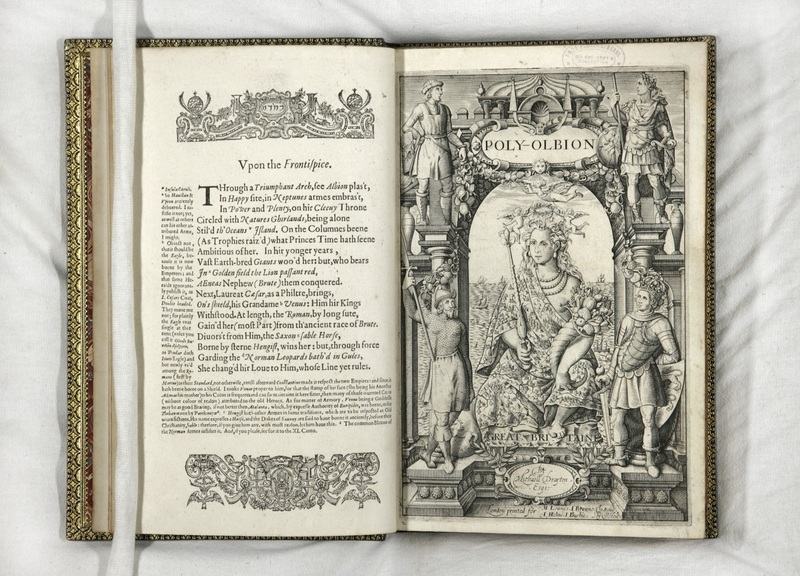 The Poly-Olbion is currently on display in the Shakespeare in his time exhibition at Sir George Grey Special Collections, Level 2, Central City Library. Author: Iain Sharp, Sir George Grey Special Collections, originally published in Real Gold: Treasures of Auckland City Libraries (2007).